Root canals vary in price depending on which tooth needs treatment (molars have 3 canals, premolars have 2 canals, while front teeth only have one canal). They are not inexpensive relatively speaking, but they are a very cost effective solution to saving a tooth which has been compromised to the point where extracting it is the only other alternative. When you are a good candidate for a root canal at our office, the typical cost is $1,100 for a molar (3 canals), $ 1,000 for a pre-molar (2 canals), and $900 for an anterior tooth (1 canal). Depending on the reason why the nerve is infected, you might also need an extensive restoration on the tooth such as an onlay or a crown. This would also be done in our office once the root canal is completed, and the cost for the restoration would be quoted to you at your initial exam (typically around $1,000 if the tooth does need a crown or an on lay). Our office is in-network with most PPO insurances. Typically root canals are covered at 80%, meaning your patient copay will only be 20% of the PPO fee for that procedure. If your specific tooth condition necessitates a buildup and a crown after the root canal, these procedures are typically covered at 50% of the PPO fee by your insurance. ​We always check your benefits ahead of time, and we will show you a breakdown of benefit for your entire treatment plan before starting any work. Our office prices quoted above are pretty typical of what you can expect, as long as your specific condition can be treated in our office. In certain cases a patient's condition can only be treated at a specialist's office, in which case you would be referred to another office. A specialist's fee is always higher than in our office, and you will be given a quote by them at that time. ​We refer to specialists whom we trust to render quality treatment at a fair price, and you will also have the option to seek a specialist's office on your own if you prefer. Sometimes a tooth just needs a root canal, and nothing else (just a simple filling type restoration to plug the access hole). 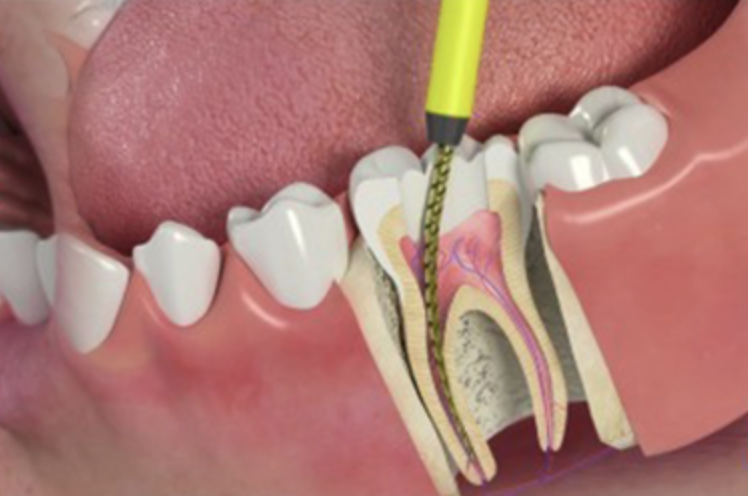 Other times the reason the nerve got infected is due to the presence of a large cavity that has compromised a lot of the tooth structure, and in that case you will also need a buildup and a crown once the root canal has been performed. ​We will take current x-rays and let you know ahead of time which is your case. The cost of the procedure is explained in the section at the top of this page.